Rolling back the years: Hertha Berlin's Vedad Ibisevic has started 2016/17 in prolific form. There is just something about the captain's armband that appears to bring the best out of Hertha Berlin striker Vedad Ibisevic. Heed James 'the Coach' Thorogood's advice - sign Vedad Ibisevic to your Official Fantasy Bundesliga team now! Just look at the statistics since the Bosnian assumed leadership duties at the start of the campaign: six games played, five goals scored and a place alongside FC Bayern München's Robert Lewandowski, Borussia Dortmund's Pierre-Emerick Aubameyang, Bayer 04 Leverkusen's Javier 'Chicharito' Hernandez and 1. FC Köln's Anthony Modeste at the top of the 2016/17 scoring charts. "It was one of the best days of my life," Ibisevic said proudly after scoring the 20th Bundesliga brace of his career in Hertha's 2-0 win over Hamburger SV on Matchday 6 - just 17 hours after his wife, Zerina, had given birth to the couple's daughter no less. "She came early, so I still had time to get enough sleep in before the Hertha game." Anyone else would have taken the weekend off - he had the Hertha hierarchy's blessing to do so - but Ibisevic is no ordinary striker. His 18 Hinrunde goals famously fuelled former club TSG 1899 Hoffenheim's nominal Herbstmeister triumph in 2008/09, before a cruciate knee injury curtailed his and the Bundesliga newcomers' unexpected tilt at domestic glory. 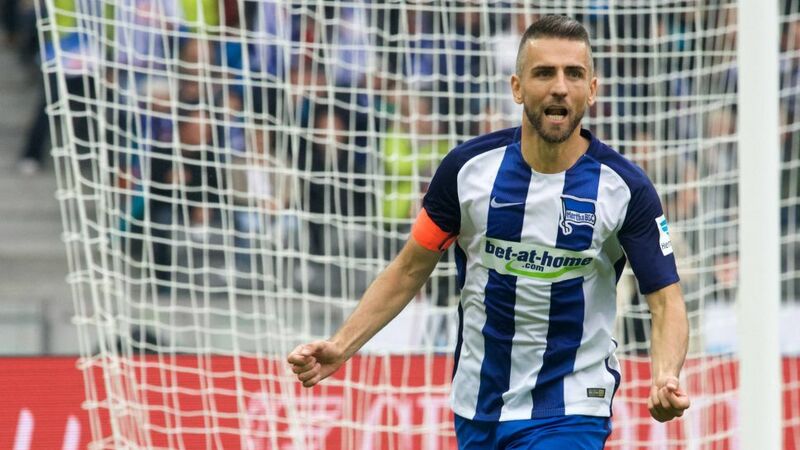 Ibisevic resumed goal-scoring duties on Matchday 7 of the ensuing campaign, when he rattled off a stunning hat-trick in a game against future employers Hertha. Since then, the ex-Hoffenheim and VfB Stuttgart frontman has netted a further 77 goals in 216 Bundesliga appearances, including four in his last two for the Old Lady. 'The Vedator' has now found the back of the net against 17 of the Bundesliga's 18 current cast members, while his brace against Hamburg - his second double in his many games - took him past the great Sergej Barbarez as the Bundesliga's all-time leading Bosnian marksman on 97 goals. "To be compared to him is a real honour for me," admitted Ibisevic, who would have been just 16 years of age when Barbarez plundered 22 goals for Hamburg in 2000/01 to become the first Bosnian in Bundesliga history to lift the Torjägerkanone. "It's not something I ever thought about at the start of my career." There is more to the Barbarez-Ibisevic comparison than Balkan blood and Bundesliga milestones, however. Six matches into 2000/01, Barbarez also had five Bundesliga goals to his name, with back-to-back braces of his own coming on Matchdays 4 and 5. The numbers are uncanny, but if 32-year-old Ibisevic can stay fit and continue to score goals with Barbarez-inspired regularity, he could yet emulate his idol once again, in the Torjägerkanone department.